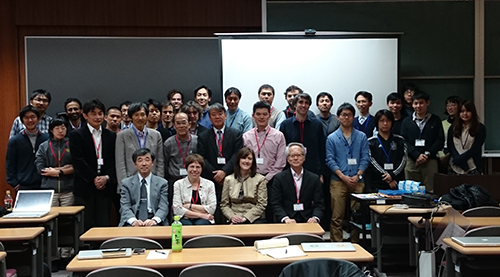 The first Joint Workshop of Geochemical Society of Japan (GSJ) and Geochemical Society (GS) co-organized by Earth-Life Science Institute, Tokyo Institute of Technology (ELSI), was held at ELSI in the afternoon of 23rd of March, 2015 in order to promote the scientific communication between both societies. This workshop was arranged mainly by Past President of GSJ, Prof. Naohiro Yoshida and President, Prof. Hodaka Kawahata based upon Memorandum of Understanding between both societies. GSJ was glad to invite Prof. Barbara Sherwood Lollar (President of GS, University of Toronto) and Prof. Laurie Reisberg (Vice President of GS, CNRS). Eight scientists presented interesting talks on the latest geochemical topics in this workshop, which approximately 100 scientists and young students joined. The participants enjoyed fruitful discussion and hoped to have similar workshop in near future. The group photo demonstrates satisfaction and peaceful atmosphere (from right side in the front row, N.Y., B.S., L.R., H.K. ).